Removal to Reading, Steuben County—Lectures on Romanism, and the Mosaic Laws, at Jefferson (Watkins) Schuyler County—Removal to Jefferson—Church Raised, and Meeting House Built—Preaching to Boatmen—Incidents—the Chemung River Association—its Churches, &c.
In 1844, I resigned my pastorate at Catlin—which, indeed, had only been nominal for some years—and, in answer to a call from the church in Reading, removed my standing and took charge of the last-named church. It was a painful task for me, with my wife, and some of my believing children, to have our names taken from the records of the Catlin church, where there were so many associations and Christian ties, which had bound us together for so long a time. Yet duty appeared to call, and I knew nothing but to obey. The Reading church had been in some respects unhappy in their choice of pastors—were somewhat divided among themselves—and it appeared I was the only man in whom they could be agreed. They promised me that I should have my liberty to attend protracted meetings, by getting them a supply, or, if that could not be done, they would cheerfully endeavor to sustain meetings themselves. There was another inducement. Jefferson—now more generally called Watkins—at the head of Seneca Lake, had gone up, under my own observation, from three or four houses, to a flourishing little village, which had all the appearance of becoming quite a mart for business. There was no Baptist church in it, nor any Baptists that I knew of. In locating for Reading, I pitched my tent a little nearer to the head of the Lake than to Reading Center, the location of the Baptist church. I had it in my heart to try and do something for the rising village. I hoped, at least in a few years, to be able to cut loose from the church in Reading, and endeavor to plant the standard on some unbroken ground. Jefferson was near by me, and appeared to claim my attention more than any other. Things went on, with the pastor and people in Reading, perhaps as comfortably and with as much good feeling as could be expected. It was not a hard task for me, in those years, to preach three sermons a day, and travel several miles, for I had a good horse and buggy, and, by making due calculations, through a kind Providence I could always meet my appointments in season. I was called, two or three times, to the head of the Lake, to preach at funerals. The people gathered almost in mass. I inquired if there were not some Baptist people in that village? I was told that there was a Mrs. C., whose parents I had formed an acquaintance with on Five Mile Creek, in Steuben county, when she was a girl at home. I thought if I could gain her influence, I might get into some place to preach. True, I had been told that it was no use for a third denomination to come into that village, as the other two were in perfect harmony, and could do all the preaching it was necessary for them to have! However, I looked at the thing, and found indeed that the head of the Seneca was a part of God’s world, and, if so, I had a right to go into it and preach the Gospel of our Lord Jesus Christ. I made inquiries for a school-house in which I might preach, but found there was no admittance. After having made a thorough effort, I failed in obtaining any place where I could set my foot and unfurl the banner of the Gospel. Things passed on a short time. I was very uneasy. I thought I could not live, within two miles and a half of such a place, and have no right of inheritance there. A circumstance occurred, one day, which proved to be the opening wedge. I was riding in my buggy, with my daughter, Mrs. Dillistin, when we met the pastor of the P. church. He held up his finger, as though he wished me to stop, so I stopped. In company with him was a brother, (a Mr. D.) who I highly esteemed from the acquaintance I had with him, and thought him a good man. One stood on one side of my buggy and the other on the other, with each of them a foot upon the forewheel of the carriage, (as we were on descending ground.) The clergyman said to me, "Eld. Sheardown, you are the very man I want to see." I inquired after his wants. He said, "The Roman Catholic bishop has been in our village, and has moved minds that I thought could not be moved. And now, sir, I wish you to come down and review the Bishop. I will tell you all I know in relation to the course taken by him." I replied, "Sir! I am not unacquainted with the course the Bishop took. I understand all that. But, sir, I am not the man to review the Bishop. That is your ground. I have no inheritance in your place—not so much as to set my foot upon. You had better do that work yourself. "—"No, sir" he said, "your age, and your experience in Papal countries, make you the very man. And now, sir, I cordially invite you to come down. You shall preach in my church," (for they had a place that was called by that name.) "I will make the appointment for you, stand by you, and aid you all that is in my power." I still told him that I could not see it my duty, under the circumstances, to undertake such a work. He urged me to give him an appointment for the next Sabbath. I told him I would think of it, and if it appeared to be my duty, I would drop him a line permitting him to make an appointment. On my way home, I overtook an old Revolutionary soldier, eminently pious—I thought him the most godly man in my acquaintance—an "elder" according to the forms of the church, the pastor of which had just asked me to review the Bishop. I drove slowly by his side, and found he was quite childish. I said to him, "Father B., what is the matter with you?" and held up my horse to hear his complaint. The good man exclaimed, "O, I am killed! I am killed! My feelings are killed!" I said, "Where are you going?" He replied, "Home"—"Well, now, I will assist you into my buggy, take you up to my house, and, if I do not get a chance to send you home, will send one of my own boys to take you." After he was seated in the buggy I said to him, "What hurt your feelings so?" He replied, weeping, that the Roman Catholic Bishop had been in Jefferson, and his pastor, "had given him his pulpit for to go through his fooleries," and his pastor sat and heard him, and he could not bear it. He said, "How can I live when I see the sanctuary of God profaned?" I endeavored to divert the old gentleman’s mind from his troubles, by talking about his nearness to the land of rest—the upper sanctuary, where nothing that maketh a lie shall enter in. After pondering the thing in my own mind, and mature deliberation and prayer, I concluded to try, if it was among the possibilities, to obtain a place and deliver a course of lectures on Romanism. But I would not fight the enemy on his own ground. I went down to the village one day, saw Senator George Guinnip, and asked him if he though it was possible to obtain the school-house for me to deliver a course of lectures on Romanism? He thought it would. He was an unconverted man, but said he would see Esq. Peck; he thought there would be no difficulty in obtaining the house for that purpose. I told him, if he could, I would deliver a lecture, every Sabbath afternoon, at half-past two o’clock. The house was obtained, the appointment given out, and I was notified that all would be in readiness. I went at the appointed time, and found more people there than could well get into the old school-house. I remarked to them, "I am glad to see so many friends present, to-day, but am afraid that you are going to be disappointed. I shall not lecture to-day directly on Romanism, but will give you a talk upon the Divinity of God’s Word—because, if you not believe the Bible to be divinely inspired, I shall in a measure be deprived of a great deal of testimony that will be very much needed through my course of lectures. Now, I wish to say to you, if I come here, it will be a great satisfaction for me to know that I am not speaking to Infidels. There will be three sources from which I shall draw my proofs. First, the Bible. Second, the history which I shall read to you from my books. Third, my experience, and the observations that I have had where Catholicism predominates. And now, if I proceed, I want to tell you at the starting point, that I make no compromise with the old mother of harlots, the abomination of the earth. She has a great many connections, who may be traced down to the thirty-second cousin. You must not expect that I shall show her any mercy. When I strike her in the face and eyes, and you see the moral blood begin to run, and I hear you whining and saying that you are too hard upon the old lady—that she’s done a great many bad things, but nevertheless she’s done some good ones—now, so sure as I hear anything like this, I shall be certain that some of her relations are present." " delivered my lecture, for it was thought no best to call it "preach." I had not progressed far in my course, before I caught the tidings, from almost the wings of the wind, that "Eld. Sheardown is a vulgar man, and makes use of very low language." I did not calculate to review the Bishop only, but at the same time to pay some attention to his sympathizers. The next Sabbath, I remarked, before the congregation, (which was always very large,) "Now, some of you have been hurt. You think the blows have been too severe; consequently, I find a report going around here that I have made use of improper language. Now, I do not want you should lay this to my parents, for I was well brought up; neither to my education, for, as far as that went, I was correctly instructed; and, as it regards my knowledge of the world, of men, and things, I can say without boasting, that I have forgotten more than many of you ever knew. But I can tell you this, that the language I have made use of, is not yet, according to your standard, half as severe as what you will find in God’s Word." Every few Sabbaths, there would be some fault-finding to review as I passed along. At length one person said to me, "There is a strange report about you, sir, in the village." I replied, "Well, that is nothing new; but what is in the wind, now? "—"Why, sir, it is reported that you have lied."—"Ah! Indeed. "—"In what does the lie consist? "—"You have said, sir, that you were invited by Mr. _____to come to the village and lecture on Romanism, which you never were. "—"Very well, I am not troubled about that. I have said so, and I say so now." I named these things in my afternoon labors, for I meant that everything that was said about me or done to me should come square out before the public. I said, "Next Sabbath, if God will, I shall look at this thing in the face, and meet it in a way that I think every individual will be satisfied who has lied. If it is susceptible of proof that I have, I will get down upon my knees before this community and confess my wrong, until this village shall be shaken as with a moral earthquake. This brought the mass of the people together the next Sabbath. After services, I stated the report, and hoped that there might be some mistake, some where, because, for a minister of the Gospel to be charged with lying, is a great thing; but to be proved a liar, is awful. I stated to the congregation the conversation that took place (while sitting in the buggy) before referred to. After I was through, the P. clergyman arose (for he was present) and said, he had no recollection of ever having said anything of the kind; that something might have been said, so remotely that the speaker might have considered it an invitation, but he did not think what he had said was even an apology for an invitation. I then repeated over verbatim, the conversation that had taken place on the highway. I then turned to the brother who was with us on that occasion, and said, "Now, Bro. D., did not your pastor make those statements and requests?" He answered, firmly, with an unfaltering voice, "He did, sir." That appeared to be the end of all strife in the mind of the public. Not ver long after this, the clergyman closed his labors, and I do no know that I have ever seen him since. After laboring on Romanism for six or seven months, every Sabbath afternoon, I came to a close on that subject, and promised, if they would give me a hearing, I would deliver a course of sermons on the Mosaic Laws—the rules and regulations of the Jewish hierarchy. I did this in order to try my strength relative to holding a congregation. I soon found, that, in a good measure, I had secured the attention and good feeling of the people in general. In 1848, I resigned my charge in Reading, and moved to Jefferson. In a financial point of view, this was one of the greatest mistakes of my life. I had bought me a very pleasant little home, thirty acres of land, with house, barn, and fruit of every kind almost, and in a fair way to finish up the last payments of my contract, when I was advised, by brethren who I thought were good financiers, to sell that precious little home, and purchase a house and lot in the village where I was to perform my labor of building up a church. I did so, and now this house and lot are all my earthly possessions. Had it been in the former homestead, it would have made a desirable place for the evening of life. But the work was fairly before me. The field to be occupied was somewhat difficult. Still, there was every inducement to labor on, hoping that, by and by, we should be numbered among the churches of the earth. We retained the old school-house in peace as a place of worship, but always by far too small for us. It had pleased God in His providence to send among us, Bro. Alfred Bellamy and wife. He was a business man, ardently pious and benevolent—in fact, my right hand man. We saw that we could not do anything unless we built a church edifice. Means, we had but very little. However, we had some prospect that the earth would help the woman, and we commenced getting our timber and other materials together, in the winter of 1849. When the summer of that year arrived, it brought with it that dire malady, the Cholera, which overset all our plans. Some of our subscribers were dead, some moved away, and others were either not able or not willing to do what they had promised or previously said they would. The day looked to us very dark. However, we took courage, got up a new subscription, and concluded to build the house. After looking over what we really wanted to meet the emergency of the case and the expectations of the community, we saw that It would cost us from twenty-five hundred to three thousand dollars. Contract let and lesser expenses calculated, we found we could not foot up with less than three thousand. There was a great deal of turning pale and trembling in view of the consequences. Our subscriptions would in no wise begin to reach the expense. While in this dilemma, Bro. Bellamy was in the city buying goods. I was on my bed, sick. The friends in the village had built a very nice Union school-house, and it looked as though the old building was left for us until we could erect a house for God. While in this condition, my son came into my room and said, "Father, the Trustees are going to sell the old school-house." I asked him when? He said, "To-night." Then I felt heart-sick; nothing but the good providence of God could save us from being cast out upon the common. I told him to attend the sale, ascertain what it was sold for, and who bought it. When he returned, he informed me that the notice of sale was illegal, and that the sale was put off, I think for two weeks, in order to give correct notice. Before the time had arrived, I was off my sick bed, and my brother had returned from the city. I said to him, "Now, I want you to buy that house." His remark was, "Why, it is literally worth nothing." I replied, "It is worth everything to us; it is our rallying point." After pressing him, he finally remarked, "I will buy it if you will stand in the gap for one-half the purchase money." I told him to go ahead. He sent a person on the night of the sale, and bought it, I think, for a hundred or a hundred and ten dollars. Its real value was very trifling, only it made us a shelter from the storm and from heat. But we had not gout out of our troubles. Very soon, we had notice served upon us to remove it from the corporation grounds. Then one great thing was, How can it be moved? But the greatest was, Where shall we put it? While walking through the village, looking for some vacant place where we could put our tent, I met a gentleman whose name I did not know. He said, "Well, Elder, I understand that you are ordered to remove your church. "—"We are," was the answer, "but that is not the worst, sir; I can not find a place to set it. "—"Well," said he, "I have got two vacant lots on that street. I am going West, to be gone a year or more, I do not know how long. You may remove it on the east lot, with pleasure, only, when I tell you it must be moved or sold, I shall expect you will do it." I thanked him very kindly and told him that any time when he wished us to take it down or take it out of the way, we would certainly do it. I immediately started for the boat-yard, to tray to get the load of a capstan, cable ropes and chains, necessary for the removal; raised a dust; and mustered help enough, from the brethren and friends, to take it to its new location. There was a great deal of wracking and cracking about the old shell, yet it held together, and the next Sabbath we were happily located in the old house on a new site. That village had some peculiar advantages—such as its canal, and its steam-boat navigation on the lake—which made it a rallying point for boats lying in the large basin over the Sabbath. Here was a field of labor that met my heart’s desire—for I always loved to preach to seamen and boatmen—and I thought to become a kind of Bethel chaplain. I told my congregation I wanted to preach on the lake shore, or else go down to the long pier and preach to the boatmen. I also asked for something that would designate the place where I should hold forth; and then described the ensign jack—a good size, with cords to it, so that I could easily bend it to one of the long poles which the boatmen always had upon their boats. I soon received a beautiful flag, with "Bethel Church" painted upon it, and, a short time after, another, what the sailor calls a swallow tail-jack. Now, I was equipped, outwardly, to my content. The villagers would turn out together, down to the boats, making me often a very large congregation. A friend, the pastor of one of the other churches, was desirous to share with me the happiness of preaching to the boatmen. I cordially took him in as a partner, but still found I had to do the greater part of the preaching. He was confined to his manuscript, and could not extemporize; consequently, if it proved to be a windy day, his craft would not hold up to the breeze, and his manuscript would be on a lee-shore. But I always felt ready and willing to aid the dear brother when those winds of affliction beat upon him, and we had good times. Our meeting house progressing, we were moving on, hoping against hope that one day it would be better with us than now. But at last we appeared to come to a stand. Brethren and friends would say, "Now, Elder, we must stop this work. It will be a disgrace to us to get into debt more than we can pay." I replied, "I do not want that we should get in debt, but I want that we should redeem all our contracts, and let the work progress. Now, brethren, if you are willing to dispense with preaching once in a while on a Sabbath, I can gather up, pretty soon, five or six hundred dollars." They thought it was doubtful, but were willing it should be tried. I knew the churches all through the country, and had no fears but what I should get aid. I started for my old ground between the Lakes. Tried Trumansburg, Covert, Farmerville, &c. All responded cordially, cheering my heart in the work. While I was laboring in this way, the trustees were paying out money as fast as I could obtain it. The Sabbath came. I went to my appointment, in the morning. In the congregation was a very good hearted man (then irreligious,) who, as I was passing through the streets to my afternoon appointment, came up to me, somewhat excited, and said, "Elder, make haste and get to the school-house. I dined," he said, "at the Washington house, to-day, and there were a gentleman and lady from New York; they told me where they had been to meeting in the forenoon, and inquired if there was any meeting in the village in the afternoon? I said, there is a man who preaches this afternoon, but it is in a miserable old school-house, scarcely fit for decent people to go into. Now, make haste," he said, "make haste, they are passing up the other side. I want you to get there first and give them the best seat we have." I could not help smiling at his earnestness, and the thought of giving the gentleman and lady the best seat we had, for their was very little superiority, as it regarded seats, in our school-house church. They were old benches, broken down and patched up, which the loitering school boys had well nigh destroyed with their jack knives. However, I had been in but a few moments before the strangers made their appearance. "There they are! There they are!" exclaimed my friend, "look out for them! Give them a good place!" (This man had been through the Mexican War, and learned to obey orders; and he spoke as though it was my duty to obey everything he commanded.) Our congregation came together as usual. I tried to preach as best I could, from a passage in Romans. I was a doctrinal subject. I saw, by their countenances, that the strangers fellowshiped the truth. When I had got through my sermon, I told my congregation that the next Sabbath I must spend in the city of Rochester, for we must have some more funds. My own heart was very tender, and for a few moments the dear brethren and sisters appeared to be in the valley of Bochim. I dismissed my meeting, after which I introduced myself to the strangers. The appeared to be courteous, kind, Christian people. In the morning, I thought I would go down to the port, or what is more familiarly termed "the steam-boat landing," thinking perhaps I might get my eye on those friends, and shake hands with them again, as I had learned they were going down the Lake. While standing, looking at the bustle on the wharf as the boat was taking in some freight, "spat" came a man’s hand on my shoulder, and behold it was the soldier again! He said, in great haste, "Elder, the gentleman and lady who were at meeting yesterday, are at the Washington house, and wish to see you before they go away. Run," he said, "with all speed, sir, for they will be going down to the boat very soon." I went to the house, inquired for their room, knocked, and received admission. The gentleman said, "Sir, I could not leave this place without I saw you again. I was deeply interested in the precious truth you preached to us yesterday afternoon. When we were preparing to retire last evening, as is our custom, at home or abroad, to kneel down and pray, it appeared to me I could not pray. The thoughts that occupied my mind, sir, were these: Now, here is one of God’s minister, with a few poor brethren and sisters around him, who are struggling to build a house of worship; and what is my duty, in view of their circumstances? I did not think, when I left home, that any benevolent object might present itself; consequently, I am unprepared, I do not belong to your denomination. I trust we belong to Christ’s Kingdom, however. I am one of the United Brethren, commonly called Moravians. I should like to spend some time with you, but we must go down on the boat. Now, sir, there are twenty dollars. Please accept, and may it encourage your heart to labor on." So that, on Monday forenoon, I was able to redeem my pledge to the mechanic, pay him up, and have money on hand. We struggled on and completed our church edifice, which cost something over three thousand dollars. It is a beautiful little house, well adapted to a rising village. We began to come to a conclusion of the whole matter. I saw that we were coming out in debt about a thousand dollars. This I had anticipated, all the way through. And in talking with Bro. Belamy, we came to the conclusion that the money should be borrowed, so that every man, employed on the work, should be paid up, before we entered it for worship; (and I do not recollect that there was a man who could righteously say, You owe me one cent.) The next thing was to find the man who had the money. I knew him, and thought we could get a loan, by giving security on the property. The gentleman was willing to do the business, but, before we come in possession of the money, he did not like the security. The house might burn down, and the lot would not be worth a thousand dollars. Some of the brethren come to me with the trouble. I remarked to them; "If that is all the difficulty, we can turn him out the insurance as collateral security; then he will be perfectly safe." He accepted the proposition. All our debts for materials and work, were thus paid off. We entered that edifice perhaps with as much gratitude as ever any poor little church did. In raising the interest at Jefferson, some sticklers for the square rule may thinks us a little loose in our management. When we were very small, we organized ourselves into a church, and attended all the ordinances of God’s house as regularly as though we had been recognized for twenty years. We called no council for fellowship, for reasons that were best known to ourselves. However, some of the pastors and deacons, in the churches between the Lakes, approved our course. We reported to the Seneca Association our numbers, increase, and diminution, as regularly as though we had been one of their body, (though this was not entered on their Minutes). We looked up to the Association as a child would look up to his father. When the time came, we called a council for fellowship, and received the hearty recognition of a large class of our brethren. I have referred, to labor performed in the open air on board of boats in the harbor, and some very interesting scenes we had. They were generally as orderly a congregation as we find in our churches. Once in a while we found a man, intoxicated, who would act under that influence. I remember, one Sabbath, having thrown our banner to the breeze, we opened services by singing, (and the friends did sing, and many of the boatmen assisted the, with a will that would almost make a Christian believe that they were on board Old Ship Zion, just entering the port.) But as I arose to pray, the intemperate man was a little noisy. I spoke very calmly to him, "Now, sir, be still—we are going to pray." He stammered out, (for his tongue was very thick, ) "Lord, I was just agoing to pray myself." Some kind friends took hold of him, peacefully led him away, and he troubled us no more. On another occasion we went down to the boats to hear a stranger preach. He had not proceeded far before it appeared evident that his knowledge of human nature was not very extensive. He endeavored to open the pit of eternal darkness, and to show the boatmen that that was their doom, and I thought he told them a great many things that they were truly guilty of, and perhaps many things that they were not; in fact, when he was through, it appeared as though he had made them out to be the most desperately wicked of all men. Indignation seemed to flash from many eyes during the sermon. It was evident that all the bad feeling that they possessed was aroused from the very bottom. After his labors were over, I remarked to them, "Next Sabbath, many of you will be here again. You will have made your trip, so far. Some will be waiting for the tow-boat to go down the lake, and others perhaps will be for working their way up to Corning. Now, I wish to say to you, if God will, I shall be here with an invitation for some of you to furnish us with a setting pole on which to hoist our colors." Then I added, with some degree of sternness, "I shall preach to you, and tell you what I think of boatmen." I redeemed my pledge. But, as I passed along the boats, there appeared to be an unusual coldness and indifference manifested. Instead of the usual kind invitation, "Come on board my boat! Come on board my boat!" I had to ask the privilege of some three or four boats, before I could get consent to establish our quarters. I endeavored to preach to them as much of Jesus as I could possibly crowd into the time allotted. But it was very evident, from their countenances generally, that they were very desirous to know what the speaker thought of them. "In an adjoining State, the Railway cars came to their terminus at a given place on one of the Canals of that State. The passengers there changed from the cars to the packet. But, on board the cars, there was a poor invalid, a young man who had been living West. He had the consumption, and was very near to his end; his great anxiety was to live to reach home, that he might die in the arms of his dear mother. The passengers in the car did not like his company, and they proposed to inform the captain of the packet, that, if he took that sick man along, they would not go with him; and they appointed one of their number to carry the message to the captain of the boat. After he had heard what they had to say on the subject, he inquired, "Gentleman, is there no one to speak for the young man? Where is he? "—"He is in the car, but we shall not go with you if you take him. "—"Very well," replied the captain, "We will see about it. I want to see the young man for myself." He went into the car, and the next thing they saw was the captain, with the young man in his arms. The captain carried the sick boy to his boat, gave him the best berth he had, and told his cook to attend to him and give him any nourishment that he could take. The travelers were very indignant at the conduct of the captain, and still declared that they would not go on board of the boat with that man. The captain looked at his watch, and said it was so many minutes before he should start. The passengers waited to see the result, whether he would leave them or not. By and by, the word was given, "Cast off the lines, boys!" There was a general rush to the packet. After they were on board, calm reflection appeared to take her seat upon her throne, and one and another began to relent that they had been so forward in endeavoring to deprive the young man of his passage. It resulted, "according to the account that I saw in the papers—not because the young man was really needy, but as a token of respect, or in other words to palliate their former conduct"—they made up a very handsome purse, and thanked the captain for his perseverance and manhood. Now, that was none other than Capt. 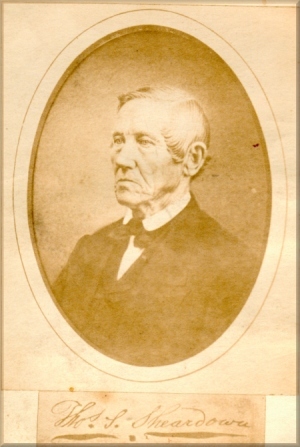 Samuel D. Kerns, well known to many Pennsylvania boatmen! "I have related this anecdote to show to you what I (unreadable text) got souls. With all their faults, I love them still." There were perhaps but few boatmen present, but what were in tears; their hearts had been reached, at least sympathetically. One word more in relation to the church in Jefferson. They did not financier, perhaps, as well as they ought to have done; their debt, for money borrowed to pay for building, was heavy upon them; but, after hard struggling, and with the assistance of the Seneca Association, they finally lifted the debt. The little church is living along, and I believe will maintain its visibility. They still remain a member of that Association which has been to them a foster-mother. In 1842, it was talked up amongst the brethren about forming a new Association, to be called the Chemung River Baptist Association. It held its first anniversary with the Campbell and Irwin church, Steuben county. This association was made up of some of the old churches, such as Big Flats, Catlin and Dix, Caton, Factoryville, Smithport and Elmira, (now called the First Church of Elmira, for they have become two bands,) and eight other churches which had been organized about 1840 and 1842, making in the whole fifteen churches, with twelve ordained ministers, four licentiates, and a membership of 1, 282. Some of the churches have changed their names since their original organization. Elmira and Fairport was originally Elmira, being named after the town, (not after the city,) and is now called Horse Heads, (sometimes, "Fairport.") There are some interesting things in relation to this church. It was gathered by the Rev. P. D. Gillette, in part an offshoot from the (unreadable), in its early years, it was composed of as good elements as any church in my acquaintance. They had a meeting house, known by the name of the "Marsh Church." It was a singular name, but true to the letter, for it stood in what might be termed a peninsula, or rather an island, in a marsh. I asked Bro. Gillette why build a house in such a place? He said it was "the geographical center, and you know some people are more tenacious about the exact center than they are to have a good location a short distance from that center." I always thought that the Horse Heads, in nature, was the very place for a house of God. I was present at the time of the organization of this church, when it took its present location. Elder Jackson had the pastoral care of the original church, and was anxious for it to remove its stand-point to the place just named. But brethren and sisters, whose hearts were bound up in the old hive where they had seen so much of the grace of God, were unwilling to break up, and instead, perhaps, of endeavoring to conciliate, too harsh measures were pursued in order to accomplish the desired end. I remember Bro. Jackson informing me of the course that had been taken. It appeared that he and a number of brethren and sisters had consulted in relation to the change, and they were willing to be led by him. He then gave me the text from which he preached, and a synopsis of his sermon, from Amos, 6th chapter and 12th verse: "Shall horses run upon the rock? Will one plow there with oxen? For ye have turned judgment into gall, and the fruit of righteousness into hemlock." He had with him nineteen or twenty, I think, who took letters at that time to lay the foundation of this new organization, and some very good brethren and sisters they were, and some equally good were left behind, much grieved in spirit. A council was called for their fellowship; much was said in relation to the capability of the little church to sustain the Gospel amongst them. I remarked that I would be decided in reference to their organization, and the fellowshiping by the council, providing Eld. Jackson, having cast in his lot with them, designed to stand by them as their pastor, until there should be a mutual agreement between pastor and people that it would be best to dissolve the connection. The reply was, "I have made up my mind, as long as the church is suited, to stand by them. I have no intention of anything else." I think, in two or three weeks, I heard that Bro. Jackson had gone to Orleans county, some supposed in view of settling, and the first thing that I knew was that he had moved his tent. Notwithstanding, the church survived; God has given them good pastors, (none better than the present incumbent, Rev. Philetus Olney." They are a strong, working, useful church. Several of their members I have been personally acquainted with, thirty-five years at least. The First Church, Elmira, I have been intimately acquainted with ever since its organization. Some of the original members still live, while others long ago have gone to their rest. I might refer to names that still survive amongst them—none more dear to me than one of their present deacons, Bro. Joseph Grover. I shall have occasion again to refer to this church. The church at Campbell and Irwin did not exist when I first traveled through that region. The Hornby church had a common center on the upland, some miles off, called Robbins’ Hill. In passing to and fro over the country where this church is now located, I used to preach in a place called Cobbs’ barn. They were mostly Presbyterian people who cared for me—warm hearted, not troubled with a great deal of sectarianism—but in those days, and I believe it is so yet, any individual who brought to them the bread of life was cordially received. I was invited, when I passed through that way, to make it my home at a Mr. Pierce’s. And a home indeed it was for the traveling pilgrim. It pleased God to convert his wife, and I baptized her. This was had work for her dear husband. He thought all his earthly comfort was gone. But, some months after, he was convinced, that, instead of having lost his earthly comfort, it had become dearer to him than ever before, for he was made the happy recipient of divine grace, and enjoyed in a great measure the comforts of God’s salvation. In conversing with him one day, he said, "Elder, do you wish to walk out?" I replied "Yes, no objection." We walked down the road, some thirty rods perhaps: he led me into the bushes, and came to a certain place, where we stopped. "There," he said, "is the spot that I have picked out, in my own mind, as a place to build a meeting house." It was a beautiful site, being an eminence overlooking the beautiful land known as Cooper’s plains. (In fact, all that part of the valley of the Conhocton is delightful.) The time appeared to have arrived when Robbins’ Hill, the favorite center of the old church, was no longer adapted to meet the necessities of the people. Many precious souls had been converted within a reasonable distance of this point, which had impressed the mind of my dear Bro. Pierce as the proper rallying place for those who had been hopefully converted to God, and for others for whom we prayed that they might follow in the same precious way. In the arrangement that was to be made in reference to houses of worship, it was agreed to change the locality of the old church to a place called Hornby Forks. This would make it convenient for quite a number of the brethren and sisters on Nash’s Hill, who had been considered a part of the mother church—the old church in Catlin. The Campbell and Irvin meeting house was built upon the site my brother had selected. The Hornby Church built their house at the forks, just referred to. Now, the brethren and sisters in the valley of Mead’s creek can go to their place of worship without climbing the hill. The other brethren, living on the upland, can be very comfortably accommodated at their common center. Though many of the dear brethren and sisters who I baptized through that region of country sleep the sleep that knows no waking until the resurrection of the just, I hope to hail them in the first resurrection. Among the departed are Dea. J. Underwood, sister St. John, and others whom I might name. Dea. St. John, I understand, is yet living, but his toils are almost ended.